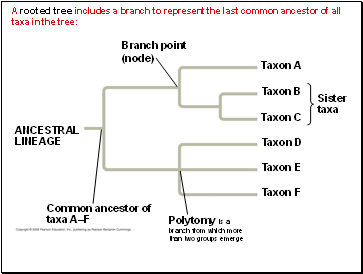 Phylogeny is the evolutionary history of a species or group of related species. The discipline of systematics classifies organisms and determines their evolutionary relationships. 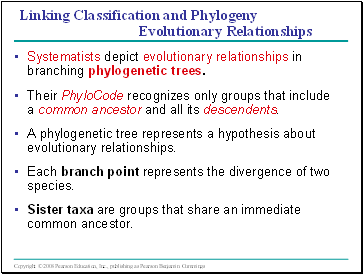 Systematists use fossil, molecular, and genetic data to infer evolutionary relationships. 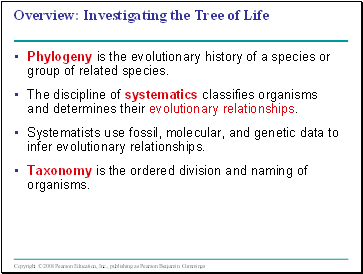 Taxonomy is the ordered division and naming of organisms. 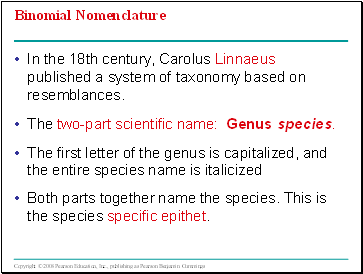 In the 18th century, Carolus Linnaeus published a system of taxonomy based on resemblances. The two-part scientific name: Genus species. Both parts together name the species. This is the species specific epithet. Linnaeus introduced a system for grouping species in increasingly broad categories. 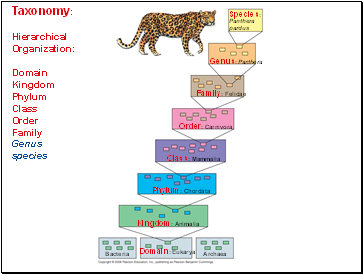 The taxonomic groups from broad to narrow are domain, kingdom, phylum, class, order, family, genus, and species. 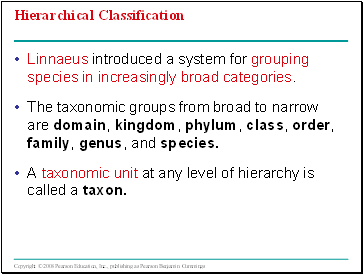 A taxonomic unit at any level of hierarchy is called a taxon. Systematists depict evolutionary relationships in branching phylogenetic trees. 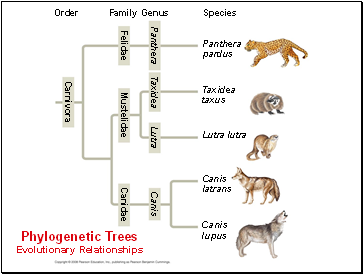 Their PhyloCode recognizes only groups that include a common ancestor and all its descendents. A phylogenetic tree represents a hypothesis about evolutionary relationships. Each branch point represents the divergence of two species. Sister taxa are groups that share an immediate common ancestor.